Moycullen footballer Peter Cook in action for Galway from the Allianz National Football League game against Tyrone at Tuam Stadium on Sunday. Photo: Mike Shaughnessy. Next Sunday the Galway footballers head up the road to Letterkenny to take on Declan Bonner’s Donegal in round two of the NFL on Sunday (2.30pm ). Kevin Walsh and his panel were understandably delighted to start last Sunday’s division one campaign in flying form, finishing 1-09 to 0-8 victory over Mickey Harte’s Tyrone. Those two points could be vital when they face Kildare in the final round of the league in eight weeks’ time. 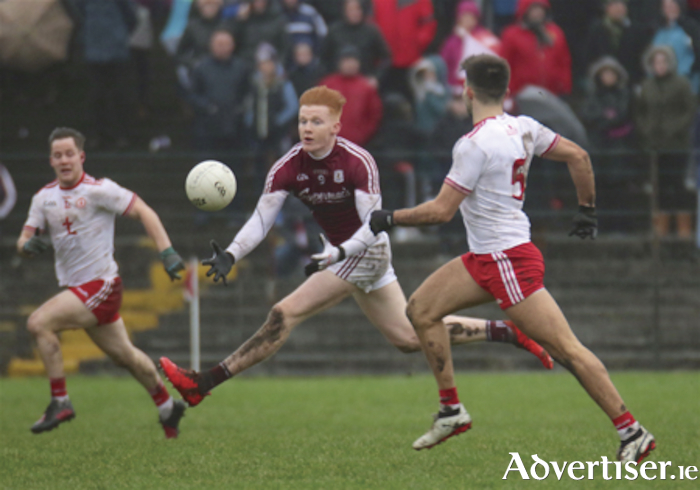 Sunday’s opening NFL fixture was Galway’s first game in the top flight in seven years, and from that perspective it was great for confidence and self belief to get a win over the Ulster champions. However, the players and management team will be fully aware there are other big challenges ahead in the coming weeks, and they need to collect as many points as possible from Donegal, and perhaps Mayo, before they face the really big guns such as Kerry away and Dublin in Pearse Stadium. Donegal will be targeting this home game as an opportunity to collect two points following their narrow one-point defeat (2-18 to 3-14 ) to Kerry in Killarney on Sunday. They have Dublin in Croke Park in the third round, so they know a loss on Sunday could see them in early relegation trouble. Galway also hammered the 2012 All-Ireland champions in the qualifiers last summer in Sligo, and the Donegal players will not have forgotten that pasting and will be keen for revenge to soothe those championship wounds. Donegal impressed against Kerry last weekend and almost collected a first win on Kerry soil since 1988. The returning Odhran MacNiallais looked a class act and was heavily involved in everything good Donegal did, while the wily Paddy McBrearty caught the eye with 0-10 (8fs ). Former Dublin star Brian Mullin’s son Nathan Mullins was doing well at midfield too until he received a straight red card in the first half for appearing to throw a leg at one of the Kerry lads. Donegal manager Declan Bonner was already focusing on the Galway game in his post match interviews. Predicting anything in this league is difficult, but it was pleasing to see the work-rate, honesty, and raw endeavour that the Galway players displayed when Tyrone came back in the second half and hit 0-4 without reply, bringing the score to 1-07 to 0-8. There was a genuine fear in the old stand in Tuam that Galway might be overrun. However a few big turnovers by the impressive Eoghan Kerin, who had a fine game, Gareth Bradshaw, and a few incisive runs by Paul Conroy who won scorable frees, helped to stem the tide. It was fitting new team captain Damian Comer was the player to score the crucial point that quelled Tyrone’s burst for something from the game. Comer set the tone for the entire game with a sensational goal after only 19 seconds following a great take from the throw-in by Peter Cooke. From a sweet pass by the hugely talented Shane Walsh, Comer (who did take at least 10 steps ) goaded. However every team needs a few decisions going their way and that was one for Galway. The home side led by 1-02 to 0-0 in the first few minutes, and Tyrone full back Ronan McNamee had been psychologically mauled by Comer and Adrian Varley before the Tyrone man was withdrawn after only 20 minutes. Those early scores were the platform on which the win was built. Others who impressed were goalkeeper Ruairí Lavelle - apart from one stray clearance that lead directly to a Tyrone point - debutant full-back Seán Andy Ó Ceallaigh, and Eamon Brannigan, who hit two lovely points early in the second half. It was also good to see both Gary O’Donnell and Seán Armstrong get a few minutes of action at the end. Their recovery from injury strengthens the squad and gives the management team options as the league progresses. Another substitute Padraic Cunningham also caught the eye on his introduction and would appear to be pushing for more game time. All in all, it was a very productive afternoon’s work. Hopefully the team can follow up such an encouraging display with another massive 70 minutes of graft and good football this Sunday.